The Democratic congresswoman from New York died March 16 at age 88 in the hospital, not the Capitol as she dreamed. But the 16-term lawmaker left a presence in the halls of Congress that some of her colleagues who also spoke at the memorial service said they still feel today. “When I go up to the Rules Committee I do feel her presence and her strong opinions,” said Rep. Doris Matsui of California, who used to serve on the panel that Slaughter led as the first woman chairwoman and most recently as ranking member. Minerva conveyed on behalf of the family how much Slaughter loved her fellow House members. She said she watched on C-SPAN the tributes colleagues gave on the House floor Tuesday and thought, given how well they knew her mother, there wasn’t anything left for her to say. It’s not that Slaughter wasn’t a family woman; her connection with them was something several of her colleagues noted in their tributes to her. Slaughter just found a way to blend her two worlds, like asking if her husband, Bob, could come to weekly policy dinners at Connecticut Rep. Rosa DeLauro’s house. DeLauro, one of the speakers at the memorial service, said she told Slaughter that Bob could come on his own. And Matsui said Bob was basically an honorary member of the Rules Committee, since he would frequently sit in on their late-night sessions before his death. House Minority Leader Nancy Pelosi recalled how beautiful Slaughter looked on the day before her death when she visited her in the hospital. “She was ready for Bob Slaughter,” the California Democrat said. Despite the strong bond Slaughter had with her husband, she made plenty of time to forge strong friendships in Congress. “Louise’s friendship was a gift, a blessing,” said Rep. Paul Tonko, a fellow New York Democrat. It was a blessing she shared. “We all thought we were Louise’s best friend,” Pelosi said. While Slaughter apparently would have been happy to spend her final years of life in Congress with her friends, Moore pondered whether the 88-year-old would’ve lived longer had she chosen a different career. “Had she not worked in this insane environment, it’s hard to believe she would have not hit 100,” the Wisconsin Democrat said. But Slaughter thrived in the insanity. Senate Minority Leader Charles E. Schumer, another New York Democrat, said she never backed down from a fight and was never afraid to speak her mind. Schumer recalled holding one of his first press conferences as a senator in Rochester with Slaughter. He lost his reading glasses, and after a frantic search, Slaughter tapped him on the back and offered him hers. It was a kind gesture, he said, but more likely a sign that she was tired of waiting on him. “I always felt she stayed in office as long as she did to give everyone time to catch up to her,” Schumer said. 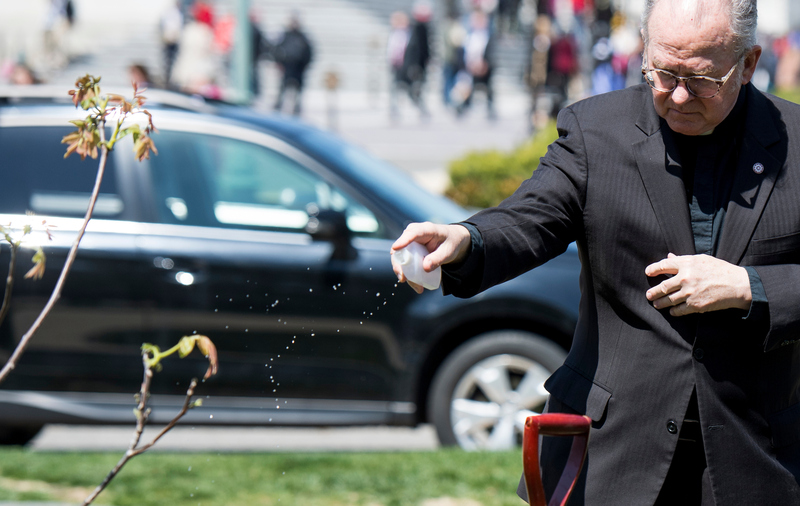 In a sign of how quickly things surrounding Slaughter move, even after her death, a walnut tree was planted Wednesday on the Capitol grounds in her honor, barely a month after her death. Pelosi said when the tree planting idea was first broached with her, she suggested it would be a nice way to mark the first anniversary of Slaughter’s death, since that’s how long the approval process would typically take. “Well, not for Louise,” Pelosi said Wednesday, noting the request was filed just last week. Slaughter’s memorial service drew many Democrats, but some Republicans showed up as well, including Rules Chairman Pete Sessions of Texas, who worked across the dais from her. GOP Reps. Rodney Frelinghuysen of New Jersey, Dan Newhouse of Washington, Phil Roe of Tennessee, Don Young of Alaska, Daniel Webster of Florida and Tom Reed of New York were also spotted. Ryan was the only Republican to speak, following all the Democrats. “Finishing last, which is exactly the way Louise would want it,” he joked. Ryan talked about the hours and years of his life spent in the Rules Committee, where Slaughter would grill him and other Republicans, catching them off guard if they hadn’t done their homework. What he said he enjoyed the most, though, was how warm she could be, waffling between sweet sentiments and direct confrontation. “You could not help but like this woman,” he said. The speakers used a wealth of adjectives to describe Slaughter, including mighty, historical, brilliant, quick-witted, determined and formidable. “She would love all this fuss,” Minerva said.